Big Walnut’s Brayden Shepherd waits for the ball as Defiance’s Braden Frederick (5) slides safely into second during Friday’s Division II state semifinal at Huntington Park. Defiance won 8-1. 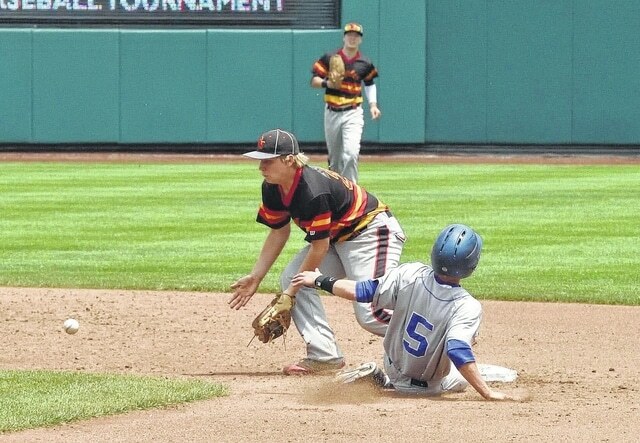 Garrett Sierra drove in three runs and Shay Smiddy pitched a complete game to lift Defiance over Big Walnut 8-1 in the Golden Eagles’ first appearance in the OHSAA state baseball semifinals Friday at Huntington Park. Early miscues proved costly for the Eagles (22-10). The Bulldogs (27-5) scored a run in the first inning and one in the third because of errors by the Big Walnut defense. Sierra opened the game by working a five-pitch walk for the Bulldogs and Wes Detter followed with a perfectly placed bunt between the pitcher and the first baseman that went for an infield hit. The Eagles looked poised to escape with no damage when the next two hitters made outs — a popout to the catcher on a bunt attempt and a flyout to right — but a double steal put runners at second and third and an errant pickoff attempt at third allowed Sierra to score the first run of the game. Smiddy led off the third inning with a double into the right field corner and was able to advance to third on a fielding error. After a lineout to first, Gage Cordray singled to center to score Smiddy to make it 2-0. Big Walnut did not have a real opportunity to score until the fourth inning, when Nick Green singled for BW’s first hit of the game. Matt Tarney followed with a walk and Jakob Evans singled sharply to center, but it turned into an out when pinch runner Connor Gerren was thrown out at third after being a little overaggressive rounding the base. Jimmy Bauer opened the Defiance sixth with a triple to the right-center gap that went all the way to the wall off of reliever Austin Becker. He scored when the next batter, Ty Castillo, singled to make it 3-0. After Bryce Borton walked, Braden Frederick hit a sac bunt to advance the runners to second and third with one out. Sierra then hit a deep fly ball to left that was run down by Mike Blackburn, but it was deep enough to score both runners and make it 5-0 after some debate about whether or not the trail runner left second base too early. The Bulldogs added three more runs in the sixth on an RBI single by Frederick and a run-scoring double by Sierra, his third RBI of the game. The Eagles offense finally broke through in the seventh inning when Tarney and Evans opened with singles. Tarney would score the only run of the game for Big Walnut on a fielder’s choice groundout. Evans led the Eagles with two hits and Tarney and Parker Imertreijs each had a hit and a walk. Tommy Fleser worked the front four, allowing two unearned runs on six hits and two walks with four strikeouts. While the game was disappointing for the Eagles, Holly hopes this is just the start. Smiddy went the distance for the Bulldogs, allowing a run on six hits and four walks with four strikeouts. He also had two hits and a walk at the plate. Wes Detter led Defiance with three hits and Bauer and Frederick each had a pair. The Bulldogs will play Poland Seminary, which defeated Bishop Watterson 2-0 on Friday morning, in the state championship at Huntington Park today at 4 p.m.
Michael Rich can be found on Twitter @mrichdelgazette.